That cancer diagnosis is the hardest thing I’ve ever endured. It’s the most scared I’ve ever been in my life. And I don’t feel it’s EVER over. So as I take a deep breath to prepare for the emotions of the day, I praise God for walking with me each step of the way. 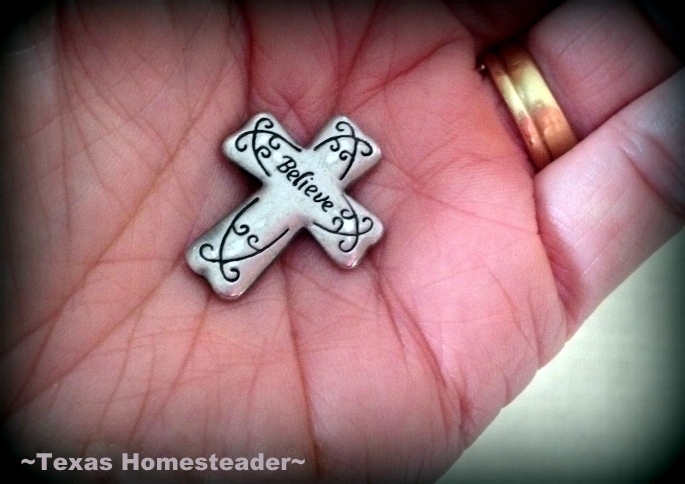 I keep this pocket cross in the lipstick pocket of my jeans every day to remind me that no matter what, He is with me. And I place it on the alter at each communion giving thanks to Him for his faithfulness and His presence throughout the whole awful ordeal. I’m thankful for my healing, and for RancherMan’s unfaltering devotion & care before, during & after my surgeries. I’m tremendously blessed by those who have stood by me and lifted me up as I trod that fearful path. And I pray for peace for others who have heard those awful words, “You have cancer“. Yet I weep at the precious lives lost to this awful disease. And I offer my heartfelt love & prayer as you go through your own journey. I pray that you’re able to lean on your faith for comfort & strength. And I hope that like me, you accept that gift of that grace as well as the love & support from angels here on earth to help you through it. I couldn’t read your post the other day because I am currently going through it now. I had lung cancer and a lump in my throat. I had 18 chemo treatments, 4 blood transfusions, 4 fluid transfusions, caught shingles, 10 radiation treatments to my brain (small cell lung cancer travels and usually to the brain, 10 radiation treatments to my neck and 30 to my chest. I didn’t even have 3 months of remission before they found a spot on my liver so 5 more radiation treatments. In a real fluke when they did a scan, it traveled to my brain and they found 3 spots. It is either brain cancer or small strokes from the radiation. I went for more scans today and will see my chemo doctor tomorrow and the neurologist next week. It is like an axe hanging over your head always. My husband fought cancer for 3 years and was just declared cancer free last month. I will remember you in my prayers. Hey Tammy, I feel for you and send prayers. I had a HUGE support system when I went through mine. They say some dogs can smell it. I think mine could. Before I found the lump he suddenly decided he would sleep on my bed with me. As soon as I had my surgery he went back to the floor beside my bed. But he was always close. He never whined when we missed puppy playtime. And after my chemo when I started feeling less tired and took him for walks, when I let him off leash he never went as far as he had prior to that time. I have a best friend who came over every Thursday (chemo day) and take me out to dinner. I had friends who took me to doctors appointments. And cooked for me. My son who worked swing shift stepped up for me. I remember so much as if it was yesterday. Emotional memories are the ones that stay with us. Yes, my heart goes out to you and many others who have, “been there” or are going through it right now. We truly are a sisterhood. 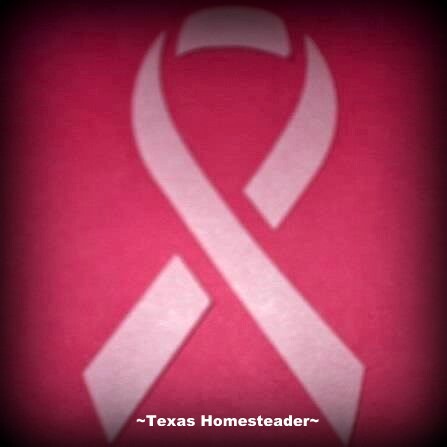 Tammy, It is always amazing to me to realize the enormity of the number of us breast cancer survivors. I’m sure any cancer diagnosis is as terrifying as this one. I have done the Susan Komen race (walk in my case) for the cure in Portland Oregon – to see all of these women, children and men – some carrying signs about a loved one stolen from their lives by cancer – is just numbing! I, too, had two surgeries. The first to confirm (hoping of course for the other option) the diagnosis and the 2nd to take a larger margin of healthy tissue to be sure the cancer was all gone. Of course after the 1st surgery I waited to hear the hoped for “non malignant” answer from the doc, but that didn’t come and it was back to the operating table. Then came the grueling months of chemo and radiation therapies. I was so cold all the time – I would wrap up in a blanket and sit out on the deck in a lawn chair in the midday sun and had to wear a stocking hat to bed. The birdman who lives with me was just great – goes to show that not everyone in this world is just about looks and appearance. At big places like Costco he could spot me across the store – short woman with a white baseball hat. Not as easy now just short woman with grey hair. There are many things in my corner of the world to be grateful for but I have to give thoughts and prayers to people all over the globe who don’t have that. Blessings to all!